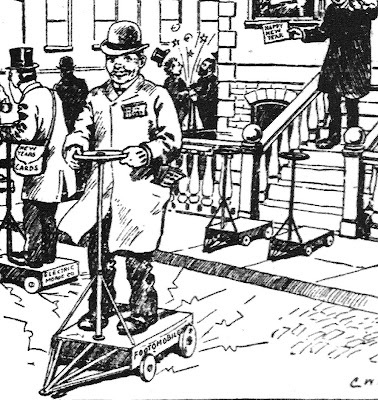 And you thought the Segway was a new idea! This image ran in the Brown County Democrat (De Pere, Wisconsin) newspaper on December 28, 1900. 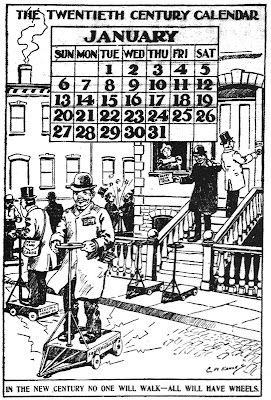 There were all kinds of predictions in 1900 of what the 20th century would bring. The "Footomobile" manufactured by the "Electric Monroe Co." appears to be just one such idea. Check out the two guys in the background running into each other. Who said the paleo-future didn't have a sense of humor? The image was found in the book Yesterday's Future: The Twentieth Century Begins. They forgot to portray how fat we all are now!